You can have a share of Sims Hill and receive fresh, seasonal veg every week. 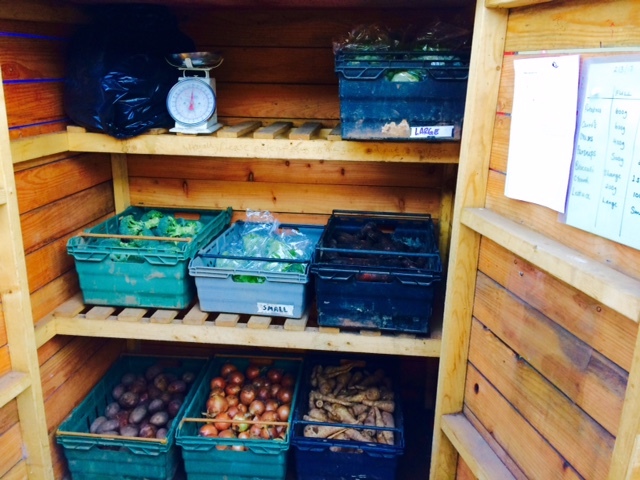 We have two sizes of vegetable box available at £7/week or £12/week. Find out more details about the vegetables and how our scheme works below, or head straight to our JOIN page to get involved. What veg will I get in a Sims Hill share? How often, where and when do I pick it up? How much is it, and how do I pay? How can I support Sims Hill? Does Sims Hill do anything apart from veg boxes? What is a share and a half share? A (full) share is what we call our “big box”; a half share is a “small box”. The half share has the same variety of vegetables as a full share, just half the quantity. Can I choose what I get/avoid certain vegetables? Sims Hill gives everyone the same selection of vegetables, just half as much for a half share. By not differentiating our shares, we reduce the workload for our growers and let them spend more time growing. Do I get to select my vegetables myself? For some pick up points we pre-prepare bags for each share to keep it neat and tidy (e.g. Bishopston). In others (e.g. Easton), the space available means it is more convenient for members weigh out their share themselves. We leave a list of the correct amount of each vegetable so that everyone can get their fair share. We run the land on permaculture and organic principles. We do not have an official organic stampmark as this is an expensive and administrative process, but we hold ourselves to high standards and we are always happy to discuss our methods. If you have any questions about how we grow, treatments we use or our methodologies, please contact us and our farm manager is always happy to explain or show you around. How often do I get veg? We provide vegetables once a week for 50-51 weeks of the year, with a “double share” the week before Christmas so that we fill you with hearty veg for the festive season, but our growers get a Christmas holiday. We ask that members commit to a weekly delivery, but if this seems too much for you then some members make arrangements to alternate weeks with a friend or neighbour. Where do I pick up my vegetables? You select one pick up point when you join, and you will always collect your vegetables from the same place. We have 7 pick up points around the city. See our map for more details. All shares are delivered by 5pm on Thursdays, and you can pick up any time after that until Sunday morning. Depending on your location there may be slightly different timings, but some points (e.g. Easton, St Werburgs) are 24 hour access. What do I do if I move house or want to change pick up points? Please contact us and we can help to see where the most convenient pick up point for you will be and whether it has space for new members. We are always willing to consider new pick up points, if we find a suitable location and there are around 6 or more shares that would want to make use of it. If you have a suggestion for a new pick up point please get in touch with us. This almost never happens! However, if there is a delay to deliver shares, an email will be sent to members, and we try to leave a note at the pick up point. If you can’t find your share or it seems to have been taken, please contact us via email. We are in Frenchay, north Bristol, UK. We grow on our field, and we also rent an area of Feed Bristol including a greenhouse and sheltered small fields. Find us onsite, and wave to us from the M32! Do all vegetables come from the Sims Hill site? So long as there are no major problems with our harvest, the majority of your vegetables over the year will be grown on the Sims Hill site. During the winter and for some of the spring (known in the trade as “the hungry gap”), the farm manager also buys in some vegetables to make sure our shares are big enough. Since 2017 we have been buying in potatoes across the year except for an early crop potato harvest from the field in the spring. We were finding that an all year potato crop from our own land was extremely time consuming, and restricted the range of other vegetables we could grow. We have strong relationships with other local potato farms, so we know we can access a high quality, good value crop throughout the year while helping our growers manage the workload of the farm in a sustainable manner. Why do you buy in vegetables from other sources? 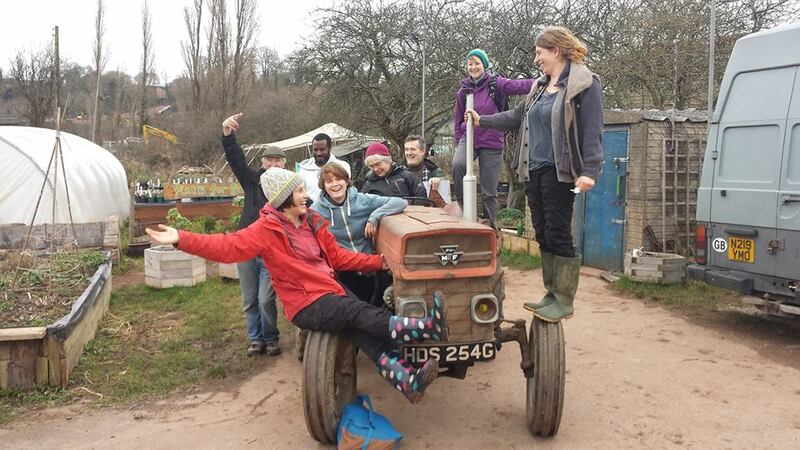 We choose to buy in because members have decided that it is better to receive a veg box all year around – some other community supported agriculture projects stop for some months of the year. Also, it becomes necessary due to our goal of a minimum of 7 different vegetables per week for a balanced diet and happy eaters. As a cooperative, this is a decision that could be revisited in the future by members. For the moment we have found that the majority of members are happy to keep the routine of their Sims Hill box, and we trust our farm manager to find the best, local sources for vegetables when our stocks run low. As we increase the fertility of our land and learn the ways of our fields, we are increasing the productivity of the land and reducing the amount we need to buy in. This is always a balance, as we want to keep the soil strong. What is Sims Hill (and why do you keep calling me a “member”)? Sims Hill is a cooperative, so if you join us you are more than a consumer to us: you are a member, a part of Sims Hill. As a business Sims Hill Shared Harvest is owned and democratically controlled by its members, and run for their benefit and for the benefit of the wider community. Being a member means you can have your say in what we grow, help take decisions about our priorities as a project, and be an active part of shaping the local community. We encourage you to come along to our meetings (5 times a year) to find out more about what is happening, and also to come up to the site as part of our Volunteer Days (one Sunday a month) or more if you are keen. We are as strong as our membership, so if you have time and energy to share then please get in touch or come to a meeting. Sims Hill is registered with Companies House as a non-profit distributing cooperative company limited by guarantee with multi-stakeholder co-operative rules. In early 2017, we had the equivalent of almost 60 full shares. By the end of 2018 we had met our ambition of growing to the equivalent of 80 full shares, which meant we fed over 110 households across Bristol and South Glos every week. We think we can get a bit bigger as our land increases its fertility and our crop rotations get into full swing. There is also the option to join our workshare scheme. You pay monthly by direct debit. Can I sign up week-by-week? We ask members to sign up for a minimum of a month, and ideally we want you to stay for the longterm. To run a sustainable farm we need to have a good sense of how much to produce for the season and year ahead. If this level of commitment feels difficult, perhaps there are friends or neighbours who would “share a share” with you so that the cost and responsibility is shared. What do I do when I go on holidays/go away travelling? If you know you will be away, the best solution for us is if you can find someone else who would like to pick up your veg while you’re gone. Share the share! This way, you don’t have to do any administration and Sims Hill gets to keep a steady membership. However, if you think you will be away for too long or this is not possible to organise, please let us know by email and we will arrange to stop delivering your share for the time agreed. What do I do if I want to leave Sims Hill? Please give us as much notice as you can (minimum 1 month). Every member is important to us, and important to our growers in planning their planting and harvesting calculations. We always welcome more help and more helpers, there are lots of things that everyone can do to help us. By choosing our vegetables you make our land more sustainable, provide local jobs and get tasty vegetables. We encourage as many members as possible to come along to our meetings. This is the best way to have your say on what we do, how we develop and find out what is going on. Check out the information on our volunteer page, become a workshare or get in touch with suggestions of how you might be able to help. We welcome one-off donations, and also have supporter members who pay a monthly contribution but choose not receive shares. This could be as little as £2/month – it really all makes a difference. Spread the word to make sure we have enough members and to share our ideas and dreams. Tell your friends about us and “like” us on Facebook! Do I have to be a member to volunteer at the site? No, we welcome anyone who wants to get outside, get some experience in sustainable land practices or has expertise or interests they are able to share. Check out the options. As well as our members veg shares, we run two fantastic social projects to help share our ethos and support local communities. Find our more about our Community Food Centre and Schools work. 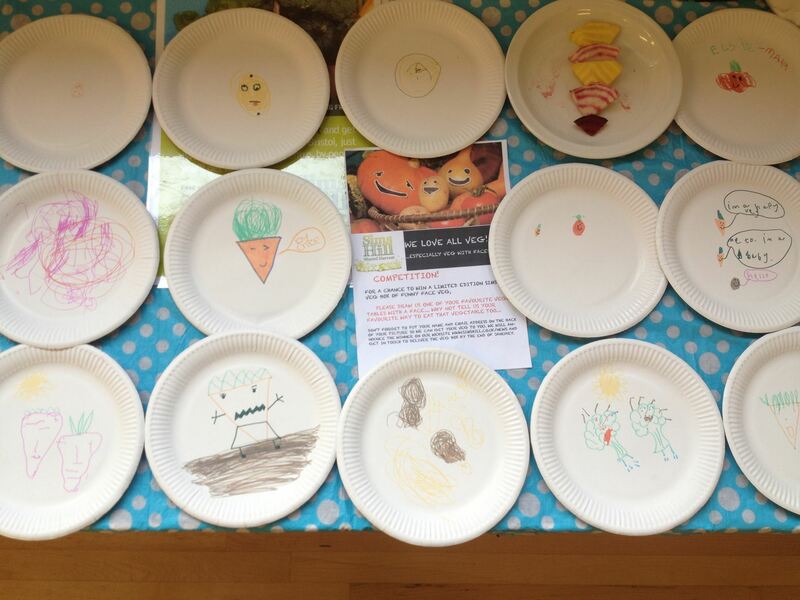 Vegetable with a face activity, Southmead 2017. How do I find out more about the background and principles of Sims Hill? You can download our Members’ Handbook, come to our next meeting or email us.